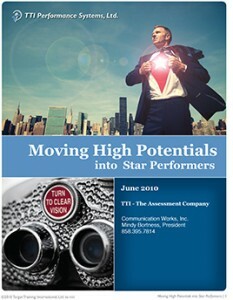 Moving High Potentials into Star Performers - Communication Works Inc. Communication Works Inc. Moving High Potentials into Star Performers - Communication Works Inc.
One measure of an organization’s health is the state of its talent pipeline. Whether preparing for executive succession, filling open management positions as the need arises, or staffing new roles created by restructuring or growth, how ready is your company to fill key positions with star performers? The answer may fall somewhere between how many superior performers you have now and how many high potentials you are currently cultivating. Forward thinking leaders don’t rely just on hiring superior performers or poaching established talent from competitors. They are mining their talent pool now, to deepen the engagement of existing stars while causing a whole new group of superior performers to emerge from the ranks.